Per-and polyfluorinated alkyl substances (PFAS) are often used in tubing and other liquid-contacting parts of an HPLC system, where they can leach into the mobile phase and interfere with sample analysis. This contamination is particularly problematic when analyying at trace levels, such as at the ppt health advisory levels for drinking water. With many labs analysing at single-digit ppt levels and striving for sub-ppt level detection, PFAS contamination from HPLC components can prevent accurate identification and quantitation of PFAS in samples. 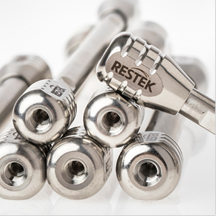 To eliminate this issue, Restek's new PFAS delay column traps and 'delays' system-related PFAS, preventing them from interfering with sample analysis. This delay column is a universal solution that can be used with any type of HPLC or UHPLC system up to 15,000 psi and with any analytical column (fully porous or superficially porous).